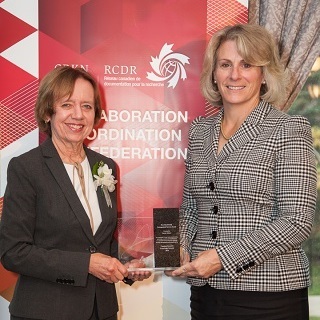 Ottawa – September 9, 2014 – The Canadian Research Knowledge Network (CRKN) is pleased to announce Carole Moore as the recipient of the Ron MacDonald Distinguished Service Award for 2014. The award will be presented on October 7, 2014 in Calgary, Alberta as part of CRKN’s Annual General Meeting. 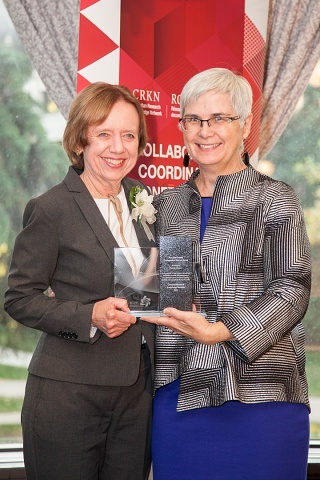 The award celebrates Carole Moore as a visionary in advancing knowledge creation and dissemination on a national scale to transform teaching, learning and research for the benefit of CRKN members. Prior to her retirement in 2011, Ms. Moore was Chief Librarian at the University of Toronto Libraries, with overall responsibility for Canada's largest academic library system. During the 25 years she spent in this role, she led a significant transformation in scholarly communications that embraced new opportunities for collaboration for the betterment of academic libraries. Ms. Moore began her involvement with CRKN when the organization was in its infancy. As one of the founding visionaries, Carole helped shape the Canadian National Site Licensing Project (CNSLP), the precursor to CRKN, by laying the foundation for building coordinated digital collections for the benefit of Canadian academic institutions. Carole served on the Steering Committee from 1998-2004 in a period of relationship-building across regions and communities, which led to the development of the first successful funding application to the Canada Foundation for Innovation in 2000. In addition to her role on the Steering Committee, she served from 2000-2004 as the first Chair of the Negotiations Resource Team (renamed the Content Strategy Committee) mandated to coordinate member consultation, build consensus regarding electronic resources priorities, and develop procurement strategies. Carole’s leadership contributed to the success of CNSLP that led to the formalization of the project with the incorporation of CRKN as a not-for-profit corporation in 2004. Ms. Moore’s legacy of leadership and collaboration within the library and research communities extends beyond her work with CRKN. During her career she served on a number of boards including those of the Library & Archives of Canada, the Canadian Association of Research Libraries, the Research Libraries Group and the Association of Research Libraries. Carole was also a driving force behind the creation of Scholars Portal, a collaborative infrastructure developed for the delivery and preservation of scholarly material. Carole’s early interest in open access is in evidence by her leadership in the creation of Canadiana.org, the organization established to digitize and preserve national heritage materials. These roles exemplify Carole’s focus on championing collaboration to advance knowledge sharing for the benefit of the academic research community. Ms. Moore started her career at Columbia University as a Reference Librarian after earning a Bachelor of Arts in Spanish Literature from Stanford University, followed by a Master’s degree from the School of Library Service at Columbia University. She subsequently moved to Toronto where she advanced through progressively responsible positions at the University of Toronto. Carole’s excellence in the library profession was highlighted in 2008 by the Canadian Association of Research Libraries (CARL) through the CARL Award for Distinguished Service to Research Librarianship in recognition of her leadership in advancing digital dissemination and preservation. She was also recognized in 1987 with the Columbia University School of Library Service Centenary Distinguished Alumni Award. The Ron MacDonald Distinguished Service Award was introduced by CRKN in September 2008 to honour the late Ron MacDonald who was a member of CRKN’s Negotiations Resource Team from February 2000 to July 2007 and who played a key role in establishing CRKN’s collaborative programs and services. The Canadian Research Knowledge Network is a partnership of Canadian universities, dedicated to expanding digital content for the academic research enterprise in Canada. Through the coordinated leadership of librarians, researchers, and administrators, CRKN undertakes large-scale content acquisition and licensing initiatives, licensing $975 million in content since 2000, in order to build knowledge infrastructure and research and teaching capacity in 75 of Canada’s universities.